Q :: I'm interested in seeing and potentially buying in Mission Ridge, now what? Q :: Are there more homes for sale in Mission Ridge than shown on this page? Or, the best way, easiest way and surest way to make sure you are finding homes for sale in the Mission Ridge area is to contact us directly and we can watch for property updates. Q :: Where does Persinger Group get information about Mission Ridge real estate? Q :: I'm a Mission Ridge Homeowner thinking about selling my Mission Ridge home. Can you tell me what you think my Mission Ridge home might be worth and what you do to market and sell homes? Mission Ridge is conviently located if you have a commute to make. As you leave I-5 and merge on to Highway 2, also known as the trestle, you take the short drive towards Lake Stevens. Instead of taking the exit onto 204 towards Lake Stevens, you stay on 20th Street SE. You drive by Highway 9 and about a mile down is the entrance to Mission Ridge. Mission Ridge is the south end of the Lake. Some of the homes in Mission Ridge have a view of the lake. In the last 365 days, 21 homes have sold in the Mission Ridge area. 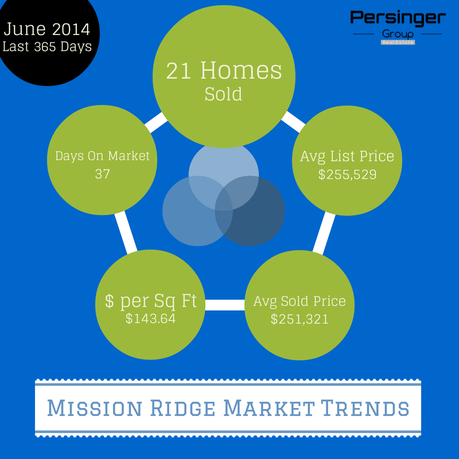 The average Days on Market for Mission Ridge homes was 37. Meaning it took 37 days from the time a Mission Ridge home was listed for sale until an accepted offer. The average selling price for a home in Mission Ridge is $251,321. With the average list price being $255,529. The average list price at the time of sale was $251,507. Meaning Mission Ridge homes are selling at 99.91% of the list price. *This data is from the NWMLS from June 2014 over the last 365 days.